Tuesday (8/20) - Head over to needle and nest to see what ideas Michelle has in store. Wednesday (8/21) - My pal Melissa grabs the baton over at Julia's Bookbag. Thursday (8/22) - It's my turn! Come back and see how I try and make lunches that are easy to eat in a very short amount of time. Friday (8/23) - Finally, cross the finish line with Whitney at Pen Pals & Picture Books! 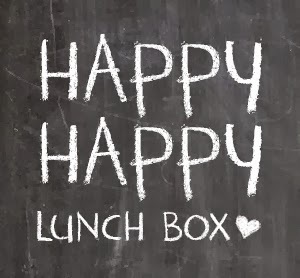 It's a Happy Happy Lunch Box week! (Only I keep saying "Happy Happy Lunch Lunch" in my head. Blame this staple of my high school years.) I'm excited to see what everyone else has in store. Thanks for reading along! Hey! This is my 300th post! Cool. Just a reminder, you can follow Silver Shoes and Rabbit Holes on Facebook. Really. I could use a few more Likes. You can also follow my crazy Pinterest boards. Do you Instagram? So do I. Do you use a blog reader? I'm partial to Bloglovin. P.S. You've got some awesome Pinterest boards. You had me at the Mac-n-cheese board. I'm following a bunch now. And thanks again for organizing this! I wanted to do a post about lunches again. This gave me the motivation! Happy Happy Lunch Lunch! And YES indeed, you have the rockingest Pinterest in town!!! Happy 300th!!! That's pretty awesome! Could you have ever imagined writing so much when you first started? How are the little ones liking their new school term? My boy is very excited! 300th post!!! That's a ton!! You've been busy! !